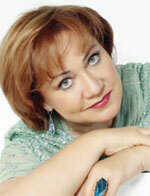 Grammy-award winning mezzo-soprano Olga Borodina is a star of the Kirov Opera, regularly appearing with the major opera houses and orchestras around the world. Winner of the Rosa Ponselle and Barcelona Competitions, she made her highly-acclaimed European debut at the Royal Opera House in 1992, sharing the stage with Plácido Domingo in Samson and Delilah—performances that launched her international solo career. She has since returned to Covent Garden on many occasions, also performing frequently at the Metropolitan Opera in New York, and with the world’s greatest orchestras and conductors. In recital, she has appeared in London (Wigmore Hall, Barbican), Milan (La Scala), Vienna (Konzerthaus), San Francisco (Davies Symphony Hall), Rome (Accademia di Santa Cecilia), Hamburg (Staatsoper), Paris (Théatre des Champs Elysées), and Amsterdam (Concertgebouw), among others. Her discography includes numerous releases on Philips Classics. Olga Borodina was awarded People’s Artist of Russia in 2002, and in 2007 was the recipient of the State Prize, the highest accolade in Russia. Titulaire d’un Grammy Award, la mezzo-soprano Olga Borodina est une star du Théâtre Mariinski et se produit régulièrement sur scène et avec orchestre dans le monde entier. Après avoir remporté les Concours Rosa-Ponselle et de Barcelone, elle a fait des débuts très acclamés à Covent Garden (Londres) en 1992, partageant l’affiche avec Plácido Domingo dans Samson et Dalila—représentations qui ont lancé sa carrière internationale de soliste. Elle est depuis lors retournée à plusieurs reprises à Covent Garden, tout en chantant au Metropolitan Opera de New York, et avec les plus grands chefs et orchestres mondiaux. En récital, elle a chanté entre autres à Londres (Wigmore Hall, Barbican Centre), Milan (Scala), Vienne (Konzerthaus), San Francisco (Davies Symphony Hall), Rome (Accademia di Santa Cecilia), Hambourg (Staatsoper), Paris (Théâtre des Champs-Élysées) et Amsterdam (Concertgebouw). Sa discographie comporte de nombreux CD chez Philips Classics. Olga Borodina a été nommée Artiste du peuple de Russie en 2002, et en 2007 elle a reçu le Prix d’État, la plus haute récompense de Russie. Die mit einem Grammy geehrte Mezzosopranistin Olga Borodina ist ein Star des Opernensembles am Marinski-Theater und tritt auch regelmäßig mit anderen großen Opernensembles und -orchestern in der ganzen Welt auf. Sie war Preisträgerin des Rosa Ponselle International Competition for the Vocal Arts und des Concurso International de Canto Tenor Viñas (Barcelona). Ihr gefeiertes Debüt in Westeuropa erfolgte 1992 am Royal Opera House/ Covent Garden, wo sie neben Plácido Domingo in Samson et Dalila [Samson und Dalila] auf der Bühne stand. Diese Aufführungen starteten ihre internationale Solokarriere. Seitdem ist sie mehrmals nach Covent Garden zurückgekehrt und auch häufig an der Metropolitan Opera in New York aufgetreten. Sie sang mit den besten Orchestern und Dirigenten der Welt. Als Konzertsolistin war sie unter anderem in London (Wigmore Hall, Barbican), Mailand (La Scala), Wien (Konzerthaus), San Francisco (Davies Symphony Hall), Rom (Accademia Nazionale di Santa Cecilia), Hamburg (Staatsoper), Paris (Théâtre des Champs-Élysées) und Amsterdam (Concertgebouw) zu hören. Zu ihrer Diskographie gehören zahlreiche Veröffentlichungen bei Philips Classics. Olga Borodina erhielt 2002 den Ehrentitel Volkskünstlerin Russlands und 2007 den Staatspreis, die höchste Auszeichnung in Russland.